UPDATED: Tue., March 26, 2019, 9:18 p.m.
CORVALLIS, Ore. – Her college basketball career had ended 10 minutes earlier in a game that could have gone either way. But Chandler Smith didn’t talk about the missed opportunities in a six-point loss Monday night to Oregon State. It was one of the biggest games of Smith’s career, the second round of the NCAA Tournament in front of a packed house at Gill Coliseum. But still just a game, one of 34 Smith played this year. The Zags won 29 of them during a season of superlatives that included the best ranking in school history (No. 12) and highest seed into the NCAAs (No. 5). And the lowest of lows. “A roller-coaster year,” Smith said. “But the Gonzaga community is an amazing place and you’re surrounded by people who want to make you better every day. Nearby sat Zykera Rice, her blue hair framing a face that didn’t yield to tears – at least not in front of the cameras. Not that anyone would have blamed her. “It’s been one heckuva ride, and last week made it that much more of a ride,” said Rice, referring to the injuries suffered by teammates Jill Townsend and another senior, Laura Stockton. The Zags rallied through that as well as the death of coach Lisa Fortier’s younger brother, Hayden Mispley. Both seniors were on the court at the end. When Oregon State took the lead with 2 minutes left – for good, as it turned out – Smith answered with a jumper. Down eight with 40 seconds left, Rice shot a 3-pointer, her second of the year – swish. Thirty seconds later, Rice heaved up another – good. Through moist eyes but with grace, Fortier answered the usual questions about the game, about the adversity of the last two weeks. 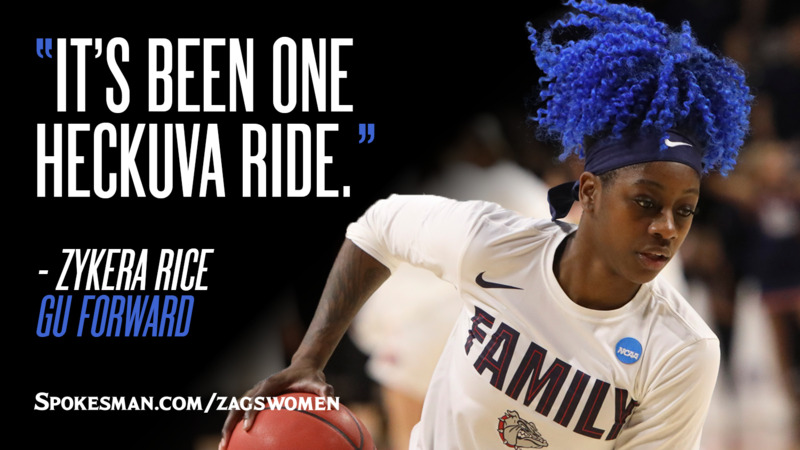 About the players – Rice, Smith and Stockton – who’ve worn the Gonzaga uniform for the last time. After mentioning the great players she’s worked with at GU – Courtney Vandersloot, Kayla Standish, Katelan Redmon and others – Fortier said, “These guys take the cake. Published: March 26, 2019, 3:54 p.m. Updated: March 26, 2019, 9:18 p.m.